South Beach rooms and suites have lovely seafront accommodation available all through the year. The views of the beach, Arran, the sea and Ailsa Craig are stunning. This is a traditional high ceiling building which has been modernised to give you all the comforts you would want to enjoy during your stay. We offer flexible accommodation to suit between one and 12 guests. There are rooms for one and suites for six and we offer the choice "bed and breakfast", "room only" or "self-catering". The rooms are spacious and the suites have their own entrance and off road parking. With all accommodation there is the use of the garden and garden furniture. By request there is a barbecue available. Prices are from £20 per person-per night for larger parties to £40 per night for singles. £40 single to £150 for six people bed and breakfast. £60 double en-suite, bed and breakfast or £50 room only. Special Diets Provision: Special diets are catered for. Vegetarian available. 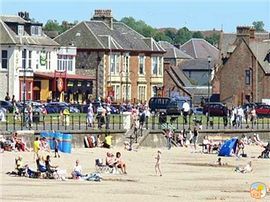 SOUTH BEACH is near Ardrossan South Beach Station. 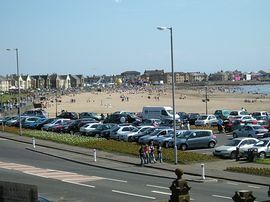 By car follow the signs to Ardrossan Ferry Terminal and then follow the seafront towards Saltcoats.